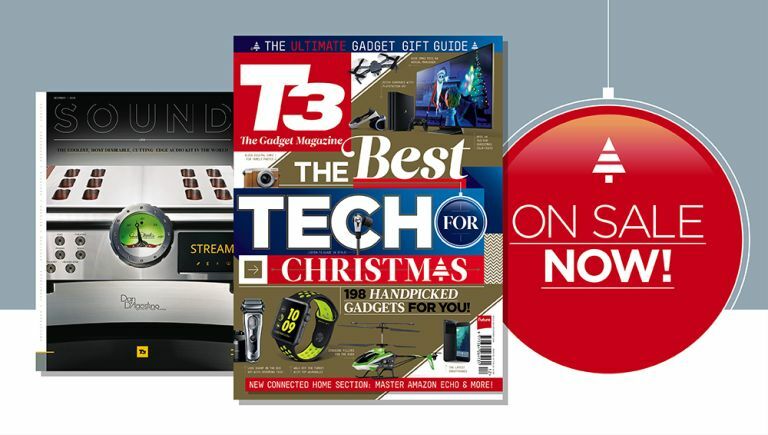 Subscribe to T3 Magazine - it’s only £6 for three issues! What’s more, we’ve put together a monstrous, massive, majestic tech competition. You can win over £11,000 of top tech. Head to t3.com/win to enter (and If you win, I’ll deliver the prizes personally. That’s a promise). Elsewhere, we’ve launched a brand new section called T3 Home. This is your complete guide to connected home tech, and every issue we’ll be showing you not only what to buy, but how to set it up. We’ll also be bringing you some objects of desire that you’ll definitely want to furnish your pad with. So merry Christmas (OK, it may not quite be Christmas) from all of us at T3. Why not treat yourself or a loved one to a subscription – it’s only £6 for three issues! So this month I’ve been lucky enough to sample some of the world’s best audio products. Y’know, I was sceptical about what a big difference high-end audio can make in your life – really, can a £10k amp be worth it. But I was blown away. So we put together T3 Sound – a free magazine with issue 262 that showcases some of the world’s finest audio components. And over the last month, I’ve had a new smartphone – the Google Pixel. I’ve experimented with a lot of phones over the past year – and up until recently the iPhone 7 Plus was my phone of choice. But I can’t get past how snappy and intuitive the Pixel is. To me, it’s a great marriage of hardware and software. If it was waterproof I would say it’s the perfect smartphone. Remember it’s only £6 for three issues! if T3 magazine! One other thing that’s been on my radar this month is Amazon Echo. In fact, not just on my radar – it’s become an integral part of my life. In the morning I ask Alexa for a new report. Then ask to listen to the radio. And in the evening I can even turn my children’ lights off (and get Alexa to read them a David Walliams story thanks to Audible integration). To me, Amazon Echo is the beginning of the smart home revolution, and it’s so exciting. Make sure you pick up a copy of our bumper Christmas gift guide issue. It’s a stonker. Until next month! We’re available in all good newsagents including WH Smith. And on the App Store (our digital edition is interactive and the UK’s best-selling monthly magazine! ).